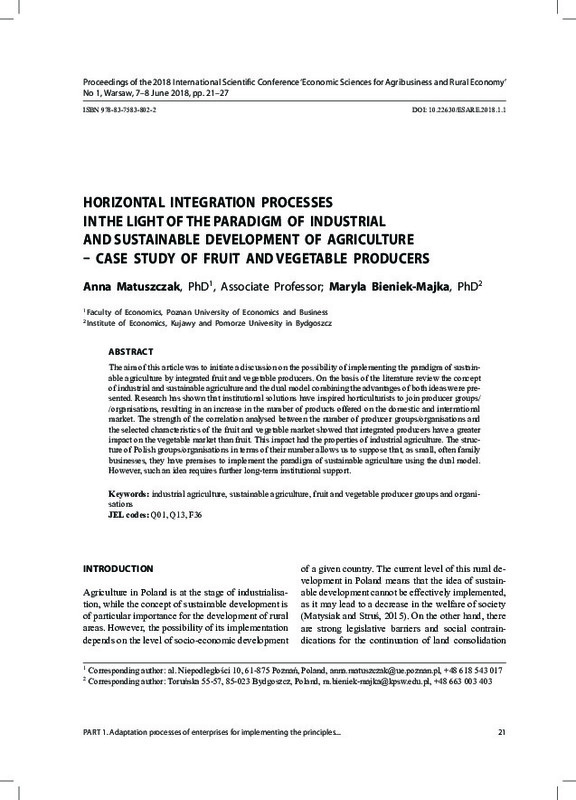 The aim of this article was to initiate a discussion on the possibility of implementing the paradigm of sustainable agriculture by integrated fruit and vegetable producers. On the basis of the literature review the concept of industrial and sustainable agriculture and the dual model combining the advantages of both ideas were presented. Research has shown that institutional solutions have inspired horticulturists to join producer groups/ /organisations, resulting in an increase in the number of products offered on the domestic and international market. The strength of the correlation analysed between the number of producer groups/organisations and the selected characteristics of the fruit and vegetable market showed that integrated producers have a greater impact on the vegetable market than fruit. This impact had the properties of industrial agriculture. The structure of Polish groups/organisations in terms of their number allows us to suppose that, as small, often family businesses, they have premises to implement the paradigm of sustainable agriculture using the dual model. However, such an idea requires further long-term institutional support.